I’ve gotten quite a bit of backlash from some readers because of my negative stance on Europe. Last year I highlighted several reports on the potential for peripheral countries to grow their way out of their debt problems. And the math was simple. It would take a miracle for austerity to result in the peripheral nations growing their way out of the debt crisis and reaching a sustainable trend. But the LTRO appears to be working so that means Europe is fixed, right?! Not in my opinion. The story remains simple. It’s a currency crisis and until the currency problem is solved the problems will continue to fester. The recent economic data across much of Europe only confirms this thinking. We see a new bout of weakness coming and Europeans are finally beginning to realize that austerity doesn’t work. So we’re once again seeing bond yields creep higher as private investors stop thinking about the LTRO arbitrage and once again focus on the issue that trumps everything – national solvency. And even more frightening are the persistent rumors of default and defection by some nations. This has the potential to set off a frightening chain of events very similar to Lehman. Europe needs to move towards greater unity, but they must stop kicking the can. Eurobonds should be moving to the forefront shortly….The only other option is potential disaster. THE BOTTOM LINE: As I’ve stated repeatedly, this crisis isn’t over until the solvency issue is resolved. Until then, expect flare ups and new scares. Same as it ever was…. 2) There have been some signs of Euro contagion in the USA – should we panic? Many earnings reports note the European weakness. Chinese data is even more alarming. Is Hugh Hendry right? Could it be Europe that triggers a crisis in China? I don’t pretend to understand the Chinese black box so I’ll leave the gambling there to others. What I do know is that the European crisis is not likely to substantially alter the US economic outcome unless we see the credit fears unravel leading to a banking crisis. This can’t be entirely ruled out, but I would be stunned if the world’s leaders are stupid enough to let Lehman 2.0 happen again. On the growth side, I’ve actually pushed back my recession expectations by one quarter based on recent data. That’s the good news. The bad news is growth in the USA appears to be peaking out in Q1 and Q2 of this year. 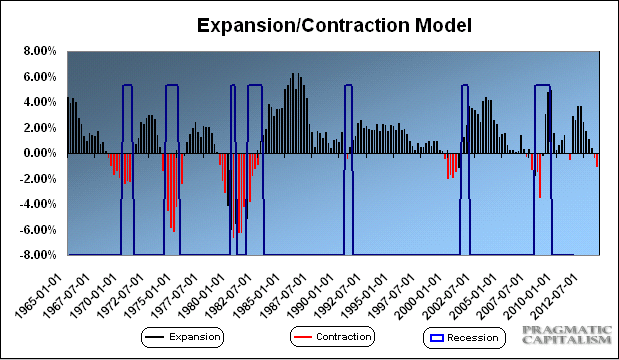 The expansion/contraction model I use is now forecasting official recession to begin in Q2/Q3 2013. The “fiscal cliff” is going to send us to the dark place where Europe is. We’ll see if Congress pulls together later this year and kicks their own can on the inevitable spending cuts…. THE BOTTOM LINE: still no need to panic. Yet.